The United States has renamed the military command responsible for the Asia-Pacific region from the "Pacific Command" to the "Indo-Pacific Command." Speaking to Sputnik, Russian and Chinese geopolitical and military analysts explained what Washington is really trying to accomplish with the name change. The renaming took place earlier this week during a ceremony which saw Trump's South Korea ambassador pick, Admiral Harry Harris, officially hand over the US command to his successor, Admiral Phil Davidson. In his address, Harris accused China of seeking "hegemony in Asia," and urged his successor to watch out for Russia, whose Asian presence he called a "spoiler." Defense Secretary James Mattis vowed that the US would continue its "steady drumbeat" of naval exercises in the South China Sea aimed at challenging China's territorial claims. Beijing fired back, saying that Harris was the one "obsessed with hegemony," stressing that China had no ambitions in this direction. — Dana W. White — DoD (@ChiefPentSpox) 31 мая 2018 г.
India's The Hindu newspaper viewed the name change as a signal that Washington considers Delhi a "key partner in its strategic planning." China's Global Times newspaper countered this statement in an op-ed arguing that Washington was merely using India, noting that Delhi's own influence in the Indian Ocean would only be hindered by closer cooperation with Washington. A day after the US command was renamed, the Chinese media reported that the People's Liberation Army Navy's new carrier group reached its "initial" combat capability for operations in the open seas. 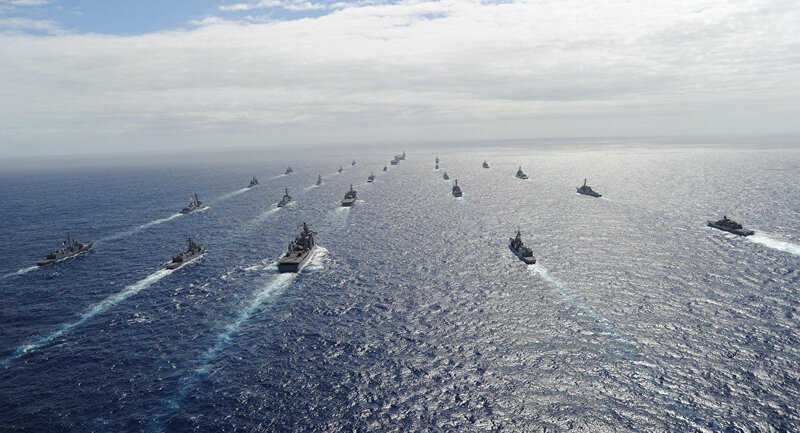 Shen Shishun, the dean of the China Institute of International Affairs' Center for South Pacific Studies, believes that the renaming of its Pacific Command hints at the Pentagon's desire for hegemony in the Indian Ocean. "On the face of things, the change in the name of the US Pacific Command to the Indo-Pacific Command may not appear a matter of great importance," Shen said, speaking to Sputnik China. "However, the United States wants to dominate the world, and is continually expanding its military activities. The Pentagon renamed its command in order to announce its presence in the Indian Ocean region," the academic stressed. "Today, many countries in the world don't want to see the US putting its nose in their domestic affairs. By expanding its military presence in the Indian Ocean, Washington is looking to strengthen its influence in the region as part of its global strategy," Shen added. According to the analyst, the name change will "undoubtedly" be followed up by further action in the region, and this will something that China will observe very closely. For his part, Russian military observer Vladimir Yevseyev told Sputnik that he wasn't surprised by China's reaction to the name change, given that geographically and strategically speaking, the South China Sea is located at the very heart of the Indo-Pacific region. Washington, he noted, seems to be expecting help from Delhi in containing Beijing. "The change in the name of the US command factually means a strengthening of the US military presence in India," Yevseyev noted. "In all likelihood, we're talking about intensified military cooperation, particularly given the weakening of US military contacts with Pakistan, and the fact that Beijing's ties with Islamabad, on the contrary, are growing stronger." Most likely, Yevseyev noted, the US will seek to conduct more military drills with India, possibly on a large scale, to try to make up for their own lack of forces in the South China Sea. — SpokespersonNavy (@indiannavy) 31 октября 2017 г. Essentially, the analyst added, the US is continuing the Obama-era "Asia pivot" strategy and running into the same problem of not having sufficient resources to redeploy from other areas. Yevseyev stressed, however, that full-fledged Indian cooperation with the US in its struggle against China is out of the question. "This will not happen given the overall success of Indian Prime Minister Narendra Modi's recent visit to China. In addition to this is the Russia-India-China dialogue, the Shanghai Cooperation Organization, and the BRICS." "The US is attempting to bind India to its own interests," the analyst noted. "At the same time, India understands that strengthening relations with the US and exacerbating tensions with China would lead to a reaction from Beijing. Therefore, I don't think that US plans will succeed. India will follow its own path, and it is clear that their involvement in the China-US conflict would not correspond to their own national interests. What we will see from India is a balanced approach." One of the components of this balancing act, Yevseyev noted, will be to increase its purchases of US weapons, while setting a portion of its market aside for the purchase of Russian weapons, and continuing its cooperation with Moscow in the nuclear sphere. In other words, he said, India has no desire to put all its eggs in one basket and will maintain ties with several partners to preserve a balance of interests. The views and opinions expressed by Dr. Shen Shishun and Vladimir Yevseyev are those of the observers and do not necessarily reflect those of Sputnik.